Ads have not always been part of inbound marketing. As recently as ten years ago, ads were highly intrusive, and untargeted. As a result, they failed to provide helpful, relevant content to potential customers. Recently, ad networks have standardized ads to blend seamlessly with organic content. They’ve started to punish advertisers who do not provide helpful content to their targeted audience, and tools like pixels and lookalike audiences have made it easier than ever to reach individuals who are interested in your offering. Research shows that search ads that use audience targeting see conversion rates two to three times higher than those that don’t. As a result, ads are now a core component of any good inbound marketing campaign. Due to these changes, we’re excited to announce today that our ads tools, which were formerly reserved for those using our Ads add-on, are now available in the Marketing Hub product for all Marketing Hub Professional and Enterprise customers. As ads continue to become an integral part of any growth strategy, this move will help our customers better align their advertising with their larger marketing efforts. All of these features were previously available in the Ads add-on, which customers could add to Marketing Hub Starter, Professional, and Enterprise for up to 25 audiences. 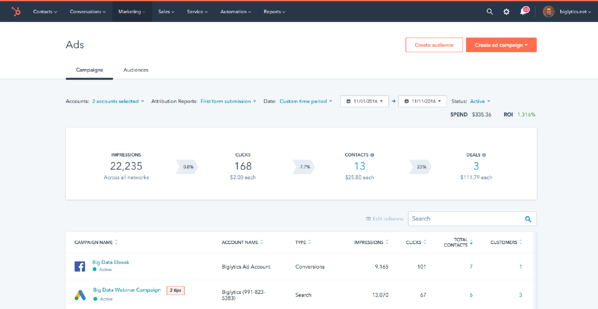 In addition to making these core capabilities part of Marketing Hub, HubSpot also announced today the availability of a new capacity pack that allows customers to expand their advertising capabilities as needed. For an additional $100 per month, customers can increase their ad spend by $50,000 per month, increase their synced audiences to 50 per month, and sync their audiences hourly rather than daily. Learn more about HubSpot Ads here.